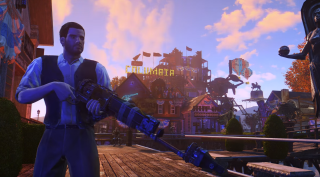 In an admirable display of skill and patriotism, YouTuber GPG Shepard has used Fallout 4's settlement building mode to recreate Bioshock Infinite's flying city of Columbia. The video above will take you on a tour through the surprisingly dense settlement, and thanks to all of the Revolution Era Americana already found in Fallout 4, the settlement brilliantly evokes the hyper patriotism of Infinite's Columbia with relative ease (the lovely tune helps, too). Shepard has uploaded and linked to everything you need to get going on your own utopic vision of Columbia, though it won't take much. According to the builder, "99 percent of the objects are vanilla objects" which means you can get started on that sky city almost instantly. They've even uploaded their save file if you want to explore, but don't want to spend several evenings putting it all together. This is one of the more evocative, impressive settlements I've seen. Amazing work.